Let me confess right up front, before you and the Almighty, that I’ve never been an ardent fan of the women’s movement. Yes, feminism brought us (and women in particular) a bundle of long-needed breakthroughs in private and public life. Of course, it also brought us forty years of nasty, vituperative, extremist rhetoric that alienated reasonable moderate males like me. But lately I’ve had to admit that men have made an unholy mess of things — even more of a mess than they usually make. Men in power have ravaged the world economy (and our personal finances) with their arrogant, obsessive high-risk gamesmanship. They’ve spearheaded murderous and idiotic terrorist movements in distant lands around the globe. They’ve embarrassed themselves in politics with their clumsy adulteries and clueless leadership. In short, they’ve convinced me that we could use a little less testosterone and a little more estrogen in public life. I welcomed the sudden appearance of so many capable women on the American political scene. Surely these smart females would saunter into their jobs with the refreshing, no-nonsense “can-do” attitude that so many smart females have demonstrated in the working world. Surely they’d rise above pettiness and human frailty. Surely they’d never make disparaging comments about their opponents’ hairstyles. Well, scratch that last remark. In fact, get ready for a lot of scratching. The catfights have begun. Yes, Carly, that's a live microphone. Granted, Fiorina didn’t realize that her microphone was live. But live microphones can be more revealing than prepackaged political statements. Fiorina regrets her televised gaffe but has refused to apologize, and that’s her prerogative. The more relevant issue is how she managed to parlay a disastrous reign as HP’s bombastic and widely disliked CEO into a political career. Some women have all the luck, not to mention the public support of influential men. 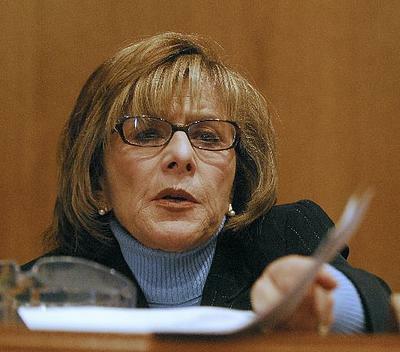 Sen. Barbara Boxer: yesterday's hair? I can understand Boxer’s appetite for due respect, but she was plainly wrong. “Ma’am” is the proper form of address for a female senator, just as “sir” would be for a male senator. 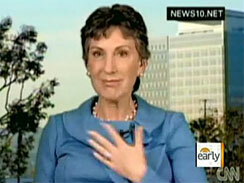 If “ma’am” is good enough for the queen of England, it should be good enough for Barbara Boxer. So what can we conclude about women in politics? Simply that they’re as human as men in politics. If the new generation of female leaders can extricate us from the wreckage that the men have left behind, I’m willing to tolerate all manner of frisky feline behavior. Aren’t you? Speaking of which, did you hear the rumor about Sarah Palin’s, um… oh, never mind. ← A Mosque at Ground Zero? Bring It On! Right you are, TK — I’m just hoping they might screw up in a less disastrous way than men. Of course, I don’t even want to think of a Palin presidency at this point. I have a feeling the Northeast and West Coast would secede from the Republic. Yeah, it may be stereotypical, but I have a feeling that this wouldn’t have happened. Well we sure have given women a lot of examples of what _not_ to do.